Matt Boland of SeaCliff Interactive recently took some time out of his busy schedule to answer some questions we had about his companys upcoming game, Super Roman Conquest. 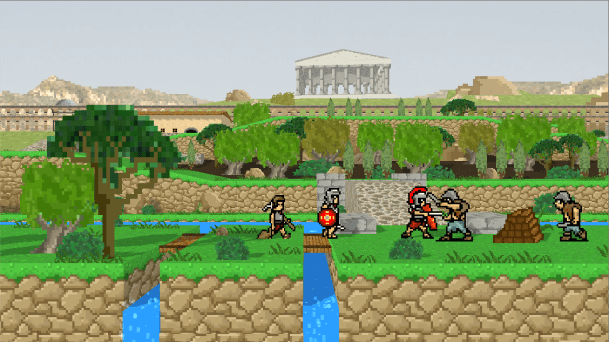 Currently in the middle of a Kickstarter Campaign, Super Roman Conquest is a side scrolling strategy game set in ancient Rome. A far cry from the sci-fi titles he worked on at Lucas Arts, we wanted to get to the bottom of why Matt and his team went they way they did, what’s up with the graphics, and just how good at haiku he is. When you’re done reading make sure to check out the Super Roman Conquest Kickstarter campaign. Don’t forget to check out our previous coverage of the game while you’re at it. Cliqist : This is where I don’t ask you about LucasArts and all the drama that undoubtedly unfolded in its final days. Matt Boland : Thanks for not asking. That means a lot. We heard about Disney buying us out same time as everyone else did. In fact we were at lunch getting burritos when people started calling us to confirm rumors. After that point, it was a nervous, dramatic, sometimes hopeful few weeks until the closure, where, once again we had no advance warning. It was kind of like the movie UHF, you know the one, with Wierd Al Yankovic? We knew there was a major decision being made about our fates and — like Weird Al trying to save the station — us scrappy devs banded together to try and impress the suits. Only unlike UHF, they ultimately closed down the station. Though we tried our damndest, made a lot of great progress, and through it all felt a great sense of comradery and respect for one another. Cliqist : How did you go from making flashy Star Wars games to a low-fi looking side view Roman strategy game? A lot of people would have expected a sci-fi shooter, or even an adventure game. Matt Boland : Yep, we’re honestly a little surprised ourselves. Between working on sci-fi games all those years, we’d often dream about creating games that are complete departures from what we did every day at work. It turned out that Matt and I were both influenced by King Arthur’s World back on the SNES, and have harbored secret desires to make an updated version of that game that expanded the strategy elements and added a meta game to the progression. KAW, along with games like Centurion: Defender of Rome, has been on our, “Awesome games that no one seems to do right these days” list for quite awhile now so we wanted to change that. It’s an honest, unabashed expression of the game we’ve always wanted to make. Sidescrolling RTS games are a rare breed, and personally we feel like we can make the best damn Sidescrolling RTS out there. That’s certainly not to say that once we publish SRC, and get that itch out of our system, you won’t see a return to sci-fi from us. 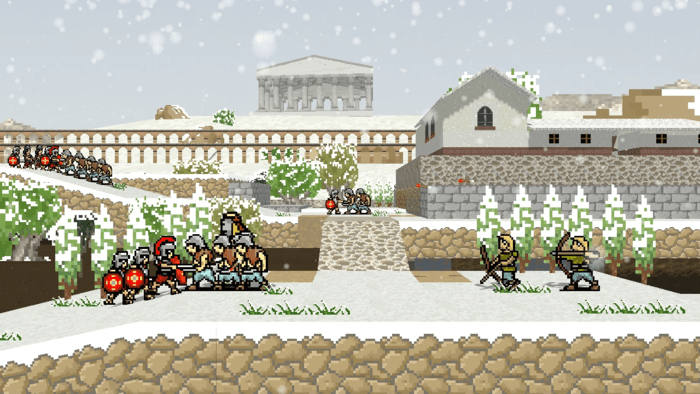 Cliqist : I just finished spending two weeks of my life neglecting my family and job while I played Rome 2. Why should I be excited about Super Roman Conquest? Matt Boland : I’m guessing much of your time spent playing Rome 2 was waiting for the enemy to take their turn or for all these patches to download. 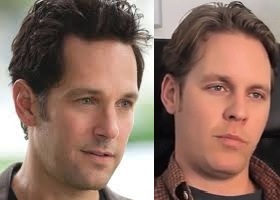 You should have spent that down time with your family, man! Don’t worry about what the Greeks are doing, tend to your children for God’s sake. As I so profoundly claimed, we are making the best damn Sidescrolling Strategy game out there. I can honestly say that SRC will be like nothing else you’ve played. We’re having a great time making the game and look forward to playing it more than anyone else. Also unlike heavier strategy games like Total War or Crusader Kings we’re not looking to bury the player in region management or lengthy UI. Instead, we’re looking to create a game that boils our favorite strategy titles down to what we feel are their greatest strengths: epic, tactics filled battles and dynamic, campaign altering choices. Matt Boland : We totally understand why people wouldn’t be enthused about the graphics we’ve shown so far. Every piece of art is hand-done by either Matt or me, and we are not artists. We are designers first and foremost, and what you’ve seen is an approximation of the art style we’re going for. That’s why we’re in contact with some of our favorite pixel artists — we need someone’s full time help to bring this art style to life. We are finalizing our artist selection, and hope to share some news and new concepts with you soon. Cliqist : Is it frustrating that while all of your Kickstarter game screens say “Placeholder Art – Not Final” under them, people still seem to assume that that’s how the game is going to look in the end? Are people ready to see the dark underbelly of game development and placeholder art? Matt Boland : Yeah, it’s frustrating, but understandable. People are very visual, and want to believe what they see. This can work in your favor when you have really slick concept art, or impressive technical visuals. But for us, we are showing consumers the sausage factory, not the end product, and that can be a turn off. As I mentioned before though, a significant portion of our Kickstarter funding will be used to hire an excellent pixel artist. This will also let Matt and I focus more on the design and development of the game systems which I think is best for the game and for everyone who doesn’t like our current (placeholder) art. Cliqist : How do you prevent the game from degenerating to players rushing the enemy? Does it just come down to the lanes you’re adding, or is there something more? Matt Boland : If you have a ton of units, and you don’t mind losing them all, you could try this tactic. It’s not sustainable, though. You need to keep your units alive to use them again in the next encounter. Rushing the enemy and taking many casualties won’t earn you enough resources to make up for the losses. Plus, your veteran units gain experience as you use them so hopefully this creates a kind of camaraderie between you and your digital troops similar to the newest X-COM. Remember how terrible you felt when that character you groomed from a Rookie and named Ronald McDonald died when fighting a chryssalid in some abandoned town in China? Well we’re not trying to make anyone cry or anything but we’re looking hope to design systems that reward players that look after their experienced units. Our enemies and maps are designed with plenty of Rock Paper Scissors relationships and systems at work, such that there is never a single-winning tactic for each encounter. Your troop of archers could be mowed down by enemies with higher ground, or you may need to protect an Engineer while they construct a bridge across a gap. Certainly the multiple lanes help, but even with one lane you will still have some hard decisions to make and clever strategies to employ. Cliqist : What’s the balance between the strategy map gameplay and the side view combat? Matt Boland : The Campaign Map will act as your staging and planning ground, where you’ll advance your armies to their next destination, upgrade and outfit troops, and choose a course of action during part random/part player action based decision events. It terms of pacing between side view combat encounters and this Campaign map, the best example I can think of is FTL. Similar to FTL, we don’t want to bury the player in prolonged combat moments, and we want to give the player lots of chances to “come up for air”, collect their resources, buy some awesome stuff, and dive back in. Cliqist : As of this writing you have one backer at your $5,000 level, which involves you guys hanging out. How positive are you that they’re a serial killer? That would, unfortunately, leave your other backers without a game to play. I’m sure you’re both nice guys that would be missed, but hell hath no fury like scored backers. Matt Boland : First off, we’re immensely flattered by this, and extremely thankful. I can’t speak to the specifics, but we’ve reached out to this person to thank them and make sure they didn’t accidentally make a typo while pledging. We’d like to publicly thank the person if they choose to come forward. Cliqist : Any final words you’d like to leave us with? Not relating to the last question, I mean about the game or your campaign. Matt Boland : As we approach 50% of our funding, we’d like to express our deep thanks to all our backers and once again remind everyone that the current art is placeholder and they should stay tuned for a BIG ANNOUNCEMENT regarding the art style of SRC real soon. People who have become patrons of SRC should spread the word to anyone and everyone who might be interested in an awesome game like this. Cliqist : Can you close us out with a Super Roman Conquest related Haiku? Cliqist : Thanks for taking the time to answer our questions! Matt Boland : Thanks a lot for the interview; it was a lot of fun! Learn more about Super Roman Conquest here.